The Church of England has apologised to the relatives of a bishop for the way it investigated child abuse claims made against him decades after his death. 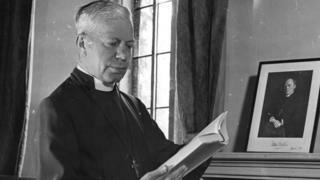 Former Bishop of Chichester George Bell, who died in 1958, was alleged to have repeatedly abused a young girl. She made a formal complaint in 1995 and, 10 years later, won an apology and compensation from the Church. A report into the handling of the case has criticised the Church's actions, describing its process as "deficient". The current Bishop of Chichester the Right Reverend Martin Warner praised the "dignity and integrity" of Bishop Bell's accuser, but said the Church inquiry paid "inadequate attention to the rights of those who are dead". Image caption In his review, Lord Carlile said the Church "failed to follow a process that was fair and equitable to both sides". The allegations against George Bell were first made by the victim, known as "Carol", in 1995, but were not investigated or referred to the police. She said the bishop began abusing her when she was five and molested her in Chichester Cathedral as she sat listening to stories. Carol said the abuse continued for about four years. In 2013, she wrote to the Archbishop of Canterbury, Justin Welby, at which point the matter was referred to police. Two years later the Church paid £16,800 in an out of court settlement and apologised to Carol. However, the "George Bell Group" of supporters of the former bishop sought and gained a review into how the Church arrived at that decision. Lord Carlile criticised the Church response as "deficient" in a number of respects and said the most significant was that "it failed to follow a process that was fair and equitable to both sides". He said the Church should be ready to acknowledge sexual abuse committed by the clergy - but that did not mean the reputations of the dead were without value. The independent reviewer said even when alleged perpetrators had died there should be methodical and sufficient investigations. He said in this case it was "clear that the Crown Prosecution Service evidential charging standard... would not have been met". Making 15 recommendations, Lord Carlile concluded the Church, feeling it should be supportive of the complainant and transparent in its dealings, failed to engage in a process that gave proper consideration to the rights of the bishop. The review recommended alleged perpetrators, living or dead, should not be identified unless adverse findings of fact are found, or it is in the public interest. It said: "Whereas in this case the settlement is without admission of liability, the settlement generally should be with a confidentiality provision." But the Archbishop of Canterbury, Justin Welby, said: "The decision to publish his name was taken with immense reluctance, and all involved recognised the deep tragedy involved. However, we have to differ from Lord Carlile's point. "The Church of England is committed to transparency and therefore we would take a different approach." Bishop Warner said: "We welcome Lord Carlile's assessment of our processes, and apologise for failures in the work of the Core Group of national and diocesan officers and its inadequate attention to the rights of those who are dead. "The emotive principle of innocent until proven guilty is a standard by which our actions are judged and we have to ensure as best we can that justice is seen to be done. "Irrespective of whether she is technically a complainant, survivor, or victim, 'Carol' emerges from this report as a person of dignity and integrity. "It is essential that her right to privacy continues to be fully respected." The Church also repeated its apology for failing to report Carol's allegations to the police when she first came forward in 1995.